It seems like we all have a constant flow of chatter happening in our brains. Some positive, some downright negative. Research is clear, the power of how we speak to ourselves is monumental. Our thoughts turn into reality. It is the Law of Attraction; “like attracts like” at work! 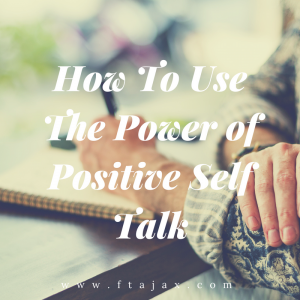 Studies have found that your self talk impacts the way we perform and behave. Journal Writing – Begin jotting down when you are experiencing negative thoughts or write an overview of your thoughts an feelings for the day. This will help you to become more aware of how your thought life affects your overall experience. Thought Stopping – As you notice that you are thinking a negative thought, tell yourself to “stop.” This is most powerful when stated out loud. Rubber-band Snap – Another way to increase insight into how often you are thinking negatively is to where a rubber band around your wrist and snap it whenever you begin to think negatively. Reframing –Most of the time, what we are complaining about are assumptions that may or may not turn out to be negative. In this case, try to find the positive or neutral counterpart and say that to yourself instead. Challenge those negative assumptions! Change Limiting Statements – We are talking about your thought life so try not to put yourself in a box! Using thoughts that limit your potential, limits your potential! Begin to erase words like “I can’t” or “There is no way” and begin to think of how you CAN or figure out a WAY that it is all possible! Pour Positivity in with Positive Affirmations – Lastly, is to remember that this is an ongoing project, loving yourself! Each morning give yourself a pep-talk and really pour positivity into yourself. Then at each moment throughout the day remind yourself of your positive attributes! The power of positive thinking is amazing! However, this may be a challenge for you. If you find that you can’t move out of your negative thought pattern or that life’s curves are just too much to deal with all at once, we would love to help you work through this process.